Not an end-user? Visit the FAQ for Publishers. I have received a FileOpen-protected document. How can I view it on my iPad®/iPhone®? You must first install the free FileOpen Viewer App from the App Store, either directly to the iOS device or first to a PC or Mac using iTunes. After installing the FileOpen Viewer App, the first step is to tap on the PDF you wish to open. 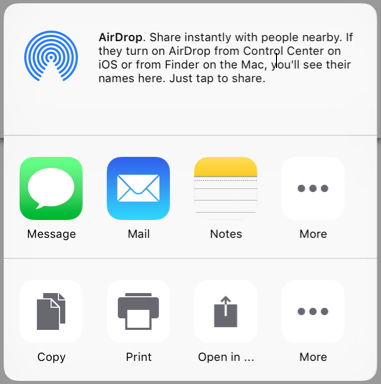 This will open a blank PDF within Apple Preview. Tap the upload icon, , in the lower right hand corner of the screen. This will bring up a menu across the bottom of your screen that allows you to access additional features and applications. Tap the more button to expose the “Open in…” menu. Tap the “Open in…” menu to locate the FileOpen Viewer App. Tap “Copy to FileOpen Viewer”. If you have not already done so, you will be prompted to authentication prior to accessing the document in the FileOpen Viewer. Do I have to be online to access a protected document? The iOS device must have internet connectivity the first time a protected document is accessed. Once that document has been opened, it may be accessible thereafter when the device is disconnected, but this depends on permissions granted by the publisher. 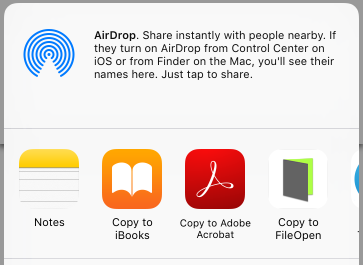 Can I view the protected document in Apple Preview? No, FileOpen-protected documents must be opened in the FileOpen Viewer. Because FileOpen-protected PDFs are standards-compliant PDF they may appear to open in other viewers, e.g. Preview, but the page content will be blank. Can I use the FileOpen Viewer App to view other kinds of documents? The FileOpen Viewer will display unencrypted OPN and PDF documents as well as FileOpen-protected documents. Can I use the FileOpen Viewer App to view documents from more than one publisher? Yes, the FileOpen Viewer is designed to enable viewing of content from any publisher using the FileOpen DRM Solutions. Which actions are tracked by the FileOpen Viewer App? The FileOpen Viewer requests permission to open files from the PermissionServer of the publisher, so the publisher’s server may retain data about which files were opened and when. Page-level notifications are not provided at this time. All usage information is sent directly to the PermissionServer of the publisher and is inaccessible to FileOpen Systems. I am having trouble accessing a file with the FileOpen Viewer App. Whom do I contact for help? 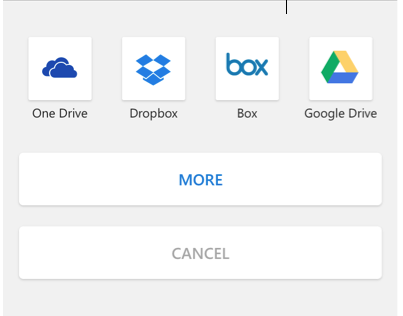 If you are able to open the file that appears in the “Recent” list of the application (FOVWelcome.opn), and the file that is linked to by that file (GetStarted.opn), then the application is installed and working. If you are not able to open files from any given publisher your first step should be to contact the publisher and describe the issue. Some publishers may need to modify their settings to enable distribution to the FileOpen Viewer, and this is not something that FileOpen Systems can do directly. If you are the publisher of the protected files (a FileOpen customer), please contact our support team. If you are an end-user trying to view protected content, please contact the publisher directly.